One of the best presents I ever received was a small landing net and telescopic rod for my 4th birthday. The first time I went fishing, I was immediately hooked and this began my lifelong passion for the sport. 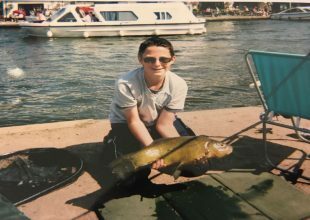 This is why I think it is something all young people should get into as there are so many benefits to it, and now with the free junior fishing licences for 13-16 year olds, it is even more appealing. I have always appreciated the fishing licence fee is money well spent. Having supported the Environment Agency’s work as an angler for a long time, I was made up to get a job here earlier this year in the Sustainable Places team. The thing I most love about fishing is being among nature and the great outdoors. It is also a great chance for relaxation and spending time with family or friends, including my mum who loves a chance to try to catch a bigger fish than me! I consider myself an all-rounder angler however, I most frequently go carp fishing. This can range from a quick few hours in the evening ‘stalking’, to camping out overnight and sometimes for several days at a time. I like to try to fit in a fishing trip of some description at least once a week – longer sessions usually limited to every couple of weeks. As someone who relishes a challenge/seeks personal goal setting, fishing is a way to channel those energies and develop skills that can be applied to wider situations including the working environment. Whether it be improving on a personal best capture, targeting an individual ‘named’ fish, tackling the challenge of fishing a new venue – honing the watercraft skills I have continued to develop ever since starting out as an angler – or simply enjoying a day of pleasure fishing, these are all things that create a buzz around going fishing for me. As I fish throughout the year (requiring an annual licence), it doesn’t feel like a large amount of money to pay. The improvements made to the availability of a three rod licence and running 12 month licence (rather than old April – March) make it much more cost effective and attractive. So why do I think young people should start fishing? 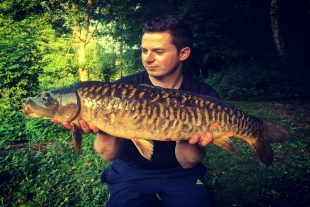 It’s not just about catching a fish and holding it for a photograph – albeit that is the reward and end result of efforts. It is something that can be passed through generations. From learning about the environment to practising being patient, there are so many life skills you pick up. And it taps into your creative side too, for example creating rigs for different fishing methods and making your own baits. Above all, have fun as fishing really is a real life adventure! The Environment Agency works with partners including the Angling Trust, Get Hooked on Fishing, CRT and the ATA to promote angling and give more people the opportunity to try fishing.